I have a wonder photographer that is helping me with pictures of my work and I wanted to share a sample of her beautiful work. All of these pictures were taken by Tricia, you might already know Tricia because she is a very active blogger, please visit her site, Saving Room For Dessert. Tricia is not only a great photographer but wow, she can cook, and is a wonderful baker. She is always creating new recipes and also loves kayaking, hiking, watching great movies, baking and traveling. Tricia has sent me a lot of photos over the last few weeks, I love all of her pictures!! I hope you enjoyed seeing Tricia’s pictures and I hope you will check out her blog, Saving Room For Dessert! Tricia makes some wonderful, delicious pies and has included many recipes on her blog. The Teardrop shaped cutting board I hand crafted using Black Walnut! 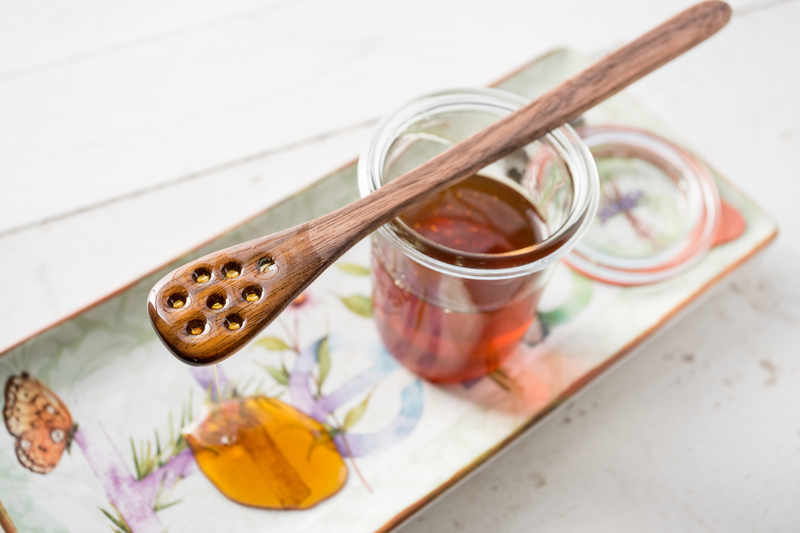 Honey Dipper Sticks are great if you like using honey! The above board is handcrafted using Walnut, Cherry and Ambrosia Maple! Do you remember when no one knew what a kiwi was? 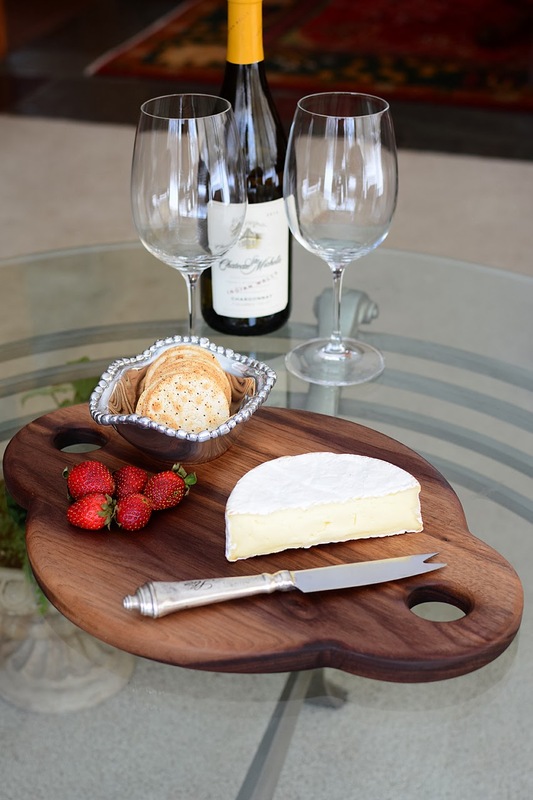 Walnut cheese boards are great for serving your favorite cheeses, crackers and maybe cold cuts! If you are interested in my woodwork, browse my site or email me if you have any questions! I spent nearly 7 hours today removing the remaining bark, running them thru the planner on both sides and cleaning up the edges. They are looing really nice, a few cracks but that adds character. Most all of these are 12 inch in diameter and 2 inches thick. All of them have really great color and should finish out beautifully! They will make great cutting boards, serving boards or plate chargers! The National Weather Service has predicted a winter storm for our area starting Monday evening thru Tuesday with accumulations of 4 to 7 inches of freezing rain, sleet and snow! Where ever you are, I hope you are in a warm place! I will soon be adding a new board design, see picture below! I wanted to show you a custom board I finished and shipped this week. Sometimes when I pull out my lumber to begin making a new piece I can tell that the wood is beautiful, this time it turned out more beautiful than I initially thought. Walnut has ever rick color. The customer wanted a large board made from walnut to use in his kitchen. This is a custom size board, 20 x 30 inch and made using American Walnut. I am not sure exactly how they plan to use the board other than he mentioned that he does a lot of baking. Since he lives in California, it will take 3-4 days before FedEx delivers the board, I sure hope he likes it! As a gift with every board I send a free tin of Wood Conditioner. My Wood Conditioner is homemade combining a mixture of food-grade mineral oil and pure beeswax. It will help you maintain the finish on your boards, reviving, condition and help protect your boards from moisture and drying out. To learn more, visit my Wood Conditioner page. Oh My Gosh…MMM… this dark chocolate ice cream is the best ever! The taste is unbelievably rich, silky, creamy and taste like a chocolate truffle! The is the best homemade chocolate ice cream I have every had! This recipe took me nearly and hour and a half to finish, not including making the ice cream in the ice cream maker! Take your time, read thru the recipe several times so you don’t make a mistake. Melt Chocolate, chop chocolate and place into bowl. Then melt the chocolate either in a bowl over a simmering pot of water or in a microwave in 45 second burst but be sure to do this at 50% power. I prefer the microwave, you will need to also stir between heating’s until smooth. The set aside until needed, it will cool slightly. Heat Milk mixture – Heat the milk and the cocoa in a medium heavy saucepan over medium heat, whisk to blend the cocoa into the milk and bring to a boil, remove from heat and set aside. Mix egg yolks – Using your mixer, whip the egg yolks and 7 tablespoons caster sugar on high until thick, pale color and thick ribbons form. This will take about 3 minutes. Temper the eggs by whisking constantly and gradually adding the hot milk cocoa mixture until combined. Combine egg mixture and chocolate – Return this mixture to your saucepan and whisk in the melted chocolate until combined. Place saucepan on low heat until slightly thickened and a thermometer reaches 175°F which should take about 5minutes. Stir constantly to prevent sticking, especially in the corners. Transfer the chocolate custard to a bowl and place over an ice bath to cool. Stir until custard is cool. 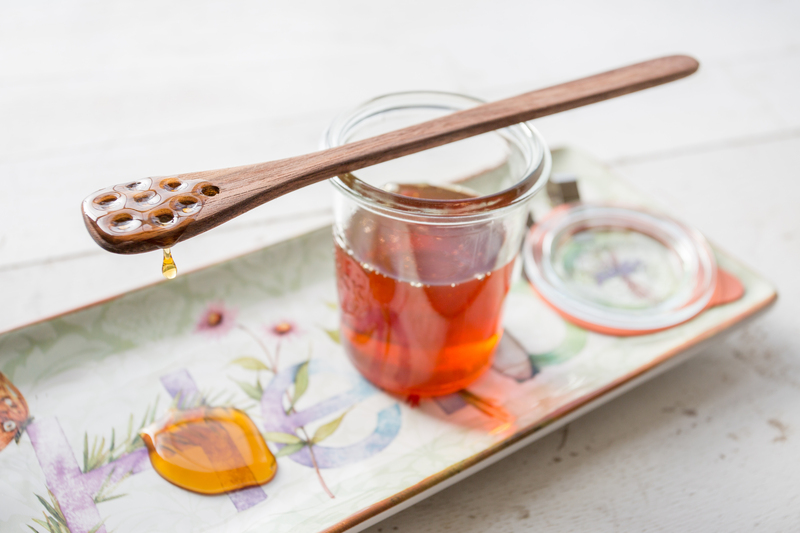 Making the caramel – Now you are ready to make the caramel, bring the remaining 6 tablespoons of caster sugar and 2 tablespoons of water to a boil in a small heavy saucepan over medium-high heat, stiring only until the sugar is dissolved. 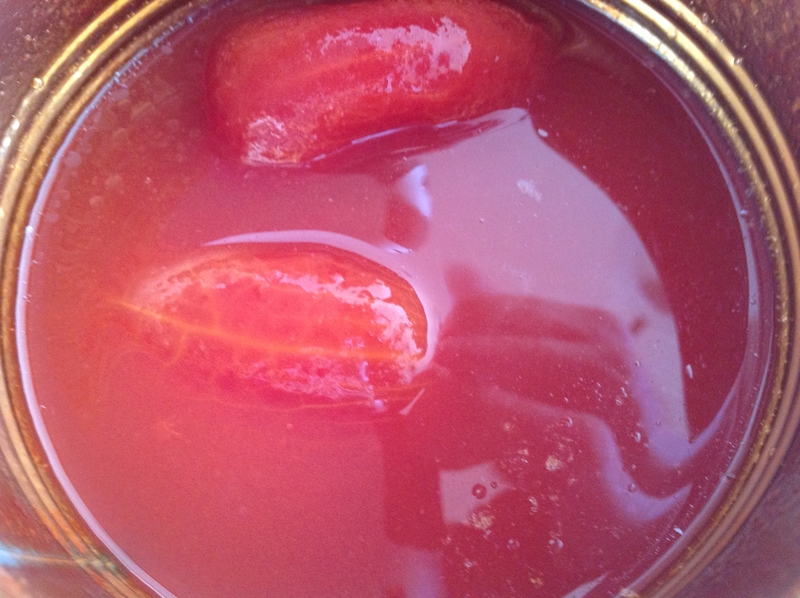 After sugar is dissolved, only occasionally swirl pan, do not stir until a dark amber color forms, about 5 minutes. Now you are ready to add the cream, be careful because the mixture will bubble. Remove from heat and whisk caramel into the chocolate custard. Then strain into a large container that will be used in the fridge for a couple of days while the mixture infuses all the flavors. Chocolate mixture in the ice bath ready to be strained. Once strained into another container please in the fridge (not the freezer) for 2 days. It is worth the wait!! This recipe seems to thicken into ice cream more quicking than other recipes. After 2 days you are ready to pour the chocolate custard into your ice cream maker to make the ice cream. Once you have ice cream, transfer it to another container and place in the freezer for 3 days before eating. Enjoy, it’s delicious and worth the wait!! Coming soon, Mint Chocolate Chip Ice Cream!! Recent post, Homemade Vanilla Ice Cream! My handmade ice cream scoops and Double Handle Cutting Boards make great gifts! We are getting hammered with the snow from Winter Storm PAX! By the time this storm ends we are suppose to have 14 inches! It’s 2o degrees with a wind chill of 11 degrees. While it is snowing I decided to write this post and introduce my two new cutting board designs. Click the link under the image to see more pictures! My new double handle cutting board is a beautiful design and it is practical for moving around food, cooking and serving food straight to the table. It is also great for your everyday kitchen chopping and slicing too. My other new cutting board is a rectangle cutting board. If you need a nice cutting board, this is it! All of my boards are handcrafted one at a time in my shop. I make both of these boards in a variety of different wood, rock hard Maple, Northern Cherry and Walnut. What do you think about my new cutting boards? I hope everyone is staying safe and warm. Enjoy your evening! My grandmother and grandfather wre Italian, both from Genoa, Italy. They both came to America in 1908. My grandmother made Pasta Fazool for us all the time. The Pasta Fazool was eaten before the main meal. Pasta Fazool means “pasta and beans” and one of our family favorites. I have been making my grandmothers recipe for nearly 30 years at least 3 or 4 times a year. My children love this soup! What is it called in your family – Pasta Fagioli or Pasta Fazool? Today, I decided to make Pasta Fazool for my wife and I. This recipe makes enough to feed 6 to 8 people so we will be having it again later in the week. It actually taste better the second day. 2-3 sliced of diced & cooked prosciutto (optional) *My children to not like me to include proscitto, so I left it out of my recipe below. Prepare the beans the night before making your overnight soaking. Bagged beans are often very dirty and contain rocks, and other debris so wash them multiple times until the drained water is no longer dirty. Look for rocks as you rinse the beans. After rinsing, put rinsed beans into a large cooking pot. Remember that the beans will swell, so use a big pot. Add water, oil and salt and cover for overnight soaking. Cut your onion, celery and carrots. Add onion, celery, carrots and bay leaf to pot and then place the pot on the stove. If you don’t have a bay leaf it will be just as good without it. I ususally start cooking early in the morning with plans to eat that evening, cooking low and slow. Cooking low will generally take about 6-8 hours. I start the termperature at 2.0 which is low heat and adjust as needed. The trick is not to cook too fast, that will break down the beans too quickly. Don’t let them boil! Above picture I just added the onion, celery and carrots. After about three-four hours I check the carrots. The carrots take longer to cook. If they are cooked, I then add the can of whole tomatoes, juice and all. I cook the tomatoes for about 30 minutes, then I will cut the whole tomato in smaller pieces. Taste and add a little more salt to taste, if needed. I continue to simmer until we are ready to eat. In another pot, cook your pasta, any small pasta shell or noodle will do. It will take about 10 minutes to get the water boiling and another 8 to 9 minutes for the pasta to cook. Don’t over cook, I will cook until al dente. We keep the pasta separate from the soup since my girls prefer it without the pasta. In the last minutes before serving, taste and add seasoning to your taste. Serve hot, adding pasta to your bowl, you will also want pepper and maybe some grated Parmesan cheese! Enjoy! Your gonna want seconds!